Welcome to the LPC and Ecole Songs website. This song book contains 32 songs chosen by Armin Lüthi for their accessibility (anyone can sing and learn by ear), diversity (representing a broad range of languages, cultures and traditions of song), and easy introduction to harmony (via rounds and part- singing). 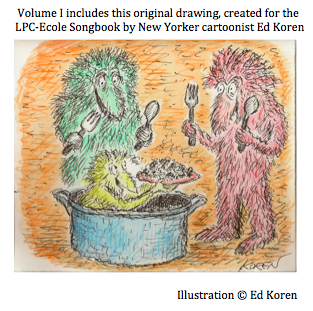 We are grateful to the extraordinary artists from within the LPC/Ecole family who contributed illustrations for the songbook, which includes an original drawing by renowned New Yorker cartoonist, Ed Koren. Ed designed the LPC logo and his son Nat was an LPC camper many moons ago in Freedom, New Hampshire. Other contributors include Charles Chu, celebrated artist and father of Paula Chu, former LPC director, Armin and Natalie's son Piet Luethi, and daughter Molly Luethi, Michiel Blumenthal, Else Friis, Molly Graham Hickman, Xavier Hool, Kate Lanxner, Tim Moorhouse, Toki Oshima, Liam Bierschenk, Milo Webster, Travis Fuller and Maria Maier. We hope you will take joy in this collection of songs and illustrations, and will find many an occasion to sing! And if you are not yet familiar with the Ecole d'Humanité and the Luethi-Peterson Camps, we hope that these songs will serve as an introduction. You'll find songbooks for sale at Cardphile Greeting Cards. Visit these sites to learn more about LPC (Luethi Peterson Camps International) and the Ecole d'Humanité.